For certain volumes in the series, it is not unfathomable for the author to get to meet their book's subjects. But for artists at a certain echelon of fame...well, you just don't expect it to happen. 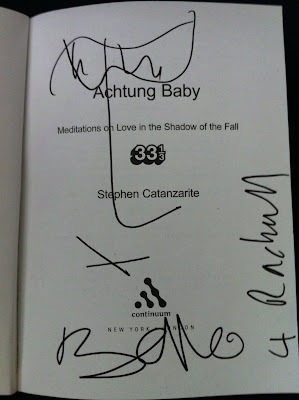 Here's the story of one of those unlikely meetings from Stephen Catanzarite, author of the 33 1/3 on U2's Achtung Baby. "Standing backstage less than a half-hour before U2 hit the stage in Pittsburgh, writer and FOB (Friend of Bono) Neil McCormick presented Bono with a copy of "Achtung Baby: Meditations on Love in the Shadow of the Fall." Neil is a fan of the book and had offered to get a copy to the man himself. It took him two years -- he wanted to make sure the timing was right. He certainly delivered. U2 is set to release a 20th anniversary box set of "Achtung Baby" later this year, and the band has been playing several tracks from the album on its massive 360 Tour. He also scored the author with a private meeting with the legendary singer. Neil told Bono of the premise of the book: "Stephen says your album is really about the Fall of Man." Bono nodded and said "That's right, it is." He then turned to me and said "Do you know what we were going to call the album?" "Sure, 'Adam'," I replied, to which the superstar laughed and said "You're good, man." He took a copy with him, but also signed a copy for my wife. McCormick also told Bono of my theorizing of a "conservative voice" in the songs of U2. "You're a statesman in the same mold as your fellow Dubliner Edmund Burke" I said, to which Bono replied "Well, thanks -- that puts me in fantastic company." Music writer Neil McCormick presenting Bono with a copy of the 33 1/3 volume on "Achtung Baby" as author Stephen Catanzarite looks on. Bono and 33 1/3 author Stephen Catanzarite, taken backstage at Heinz Field, Pittsburgh. 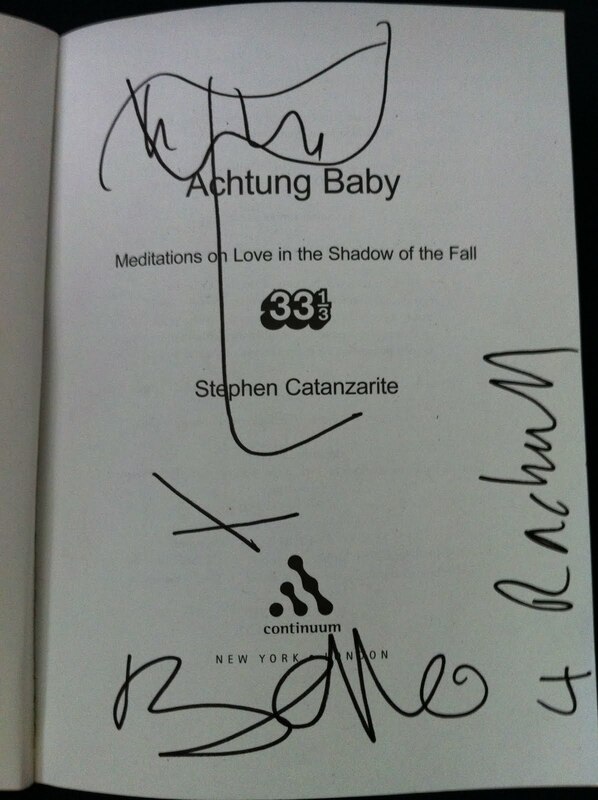 Bono's imprimatur on the 33 1/3's "Achtung Baby" (inscribed to the author's wife).